Agilent Technologies have announced the expansion of their U1050A line of Acqiris time-to-digital converter (TDC). This product line includes a new model that offers a high timing resolution, making the TDC suitable for precise timing measurements in communications, nuclear research and weapon physics applications. The single-hit time-to-digital converter (U1050A-002) has a unique 5 picoseconds timing resolution and a wide measurement range of up to 20 seconds, a ratio of 1:4.1012. The CompactPCI TDC module is suitable for applications where high timing resolution and precision are required, such as in large-scale physics experiments, including hydrodynamics, explosive testing, particle accelerator timing and nuclear fusion studies. Applications are also found in Time Domain Transmission Reflectometry in wide band, satellite and fibre-optics communications as well as in time-of-flight measurements in nuclear and life science mass spectrometry and 3D mapping using Lidar/Radar. The U1050A-002 TDC has 13 identical hardware channels. Twelve channels are independent stop inputs; the 13th is the common start. The module can operate in either single-start or multi-start acquisition modes with the timing information on all the independent channels encoded relative to the common channel. The wide operating range allows start/stop events separated by as much as 20 seconds to be recorded. The internal buffer allows the recording of up to 128 stops. 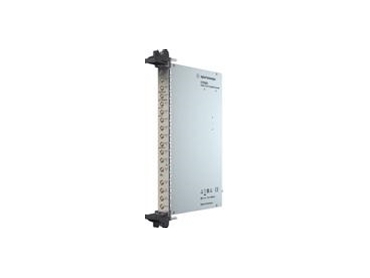 In addition, the TDC features inputs with programmable thresholds and slopes, making the module suitable for measuring the time of the rising or falling edge of fast trigger events. Time measurement on the U1050A-002 TDC can be based on either the internal low jitter (<3 ps rms), high stability (±2 ppm) clock source, or an external 10 MHz reference input. Digitised data is fed directly to the onboard FPGA-based data processing unit. This handles the data and subsequent fast readout with direct memory access (DMA) mode, for increased data throughput to the PC.